Thanks to Jin Ho, Heewon, Goo Dong-Eon, Xenix, Qho, Young Wook, and BK for a very interesting dinner discussion and explaining the Korean blogging scene to me. Korea is reported by the OECD to have the highest high-speed Internet penetration of any nation. Korea has an extremely vibrant gaming, blogging, mobile phone and youth culture scene and I was eager to find out more about what was going on. I scribbled a bunch of notes over coffee during the day and over dinner. Please excuse any errors since I have not been able to fact check everything. If you could point them out and let me update them, I would appreciate it. According to articles in the press, there are 5-6 million blogs. These are not to be confused with hompy. Hompy (a derivative of home page) are personal home pages with photo albums, guest books, avatars, background skins, and background music. There are approximately 10 million hompy pages. In a city with a population of 10 million and a country with a population of 45 million, that's quite impressive. Companies seem to be making money selling background music and items for hompy pages. Most of the posts are focused on photos and one line comments on pages of friends. They are generally closed communities and are focused more on real-time presence-like communication rather than diary or dialog. Cyworld, which sounded like the leader for hompys has a feature they call "scratch scrap". This allows you to copy/paste content from other web pages easily to your hompy. On of the problems that I see with this is that this simple built-in feature does not provide a link back to the original source. It is rumored engineers who designed this left and joined Naver, one of the leading blog companies and created a similar feature for them. Generally speaking, it sounded like people don't link very much. They are still mostly plain html and not css + xhtml. There seemed to be some trackback implementation, but it is not yet as widely used as in the US or Japan. As far as I could tell, none of the blog systems used any of the standard APIs, and some had RSS feeds. Blogs and hompys don't seem to be pinging any pinger sites, which makes them nearly invisible to the outside world. In addition, many sites block search engine bots from crawling hompys and blogs. It appears that one of the biggest problems is that there are several 800 pound gorilla type portals that remind me of AOL during it's powerful years. They try to create walled gardens of users. With millions of bloggers and hompy users in each community, they are focused more on integrating inside of their portals than open standards or linking across portals. There are some independent blog services and aggregators, but they still seem to be focused on community and somewhat inward facing networks. A not-so-visibile majority of blogs in Japan and the US are also this way, but the public facing citizen journalist or pundit-style blogs seem to be very sparse in Korea. One of the reasons might be due to the success of OhmyNews. I visited OhmyNews as well, and they are truly an online newspaper powerhouse. You can read about them in detail in Dan Gillmor's We the Media, but they are a edited news website with droves of citizen journalists who submit articles. They have courses in writing for the citizen journalists, tip jars that people can pay them through, editors to help with the important stories, lots of influence and visibility and offline community activities. I can imagine that someone who had something political or pundit-like to say might easily choose to write for OhmyNews than to start a blog. This doesn't describe everything, but I'm sure that OhmyNews has attracted a fair number of the potential media blogger types. hey joi. the function is called "scrap," not "scratch"
what it allows you to do is to display a particular post from someone's mini-hompy (cyworld) - if the permission setting of that post is set to "allow scrap" - not from just any website. there's a watermark-like feature that goes with it, which displays the original author's name and the link back to the origianl mini-hompy. Sorry about the error. I was told however, that most bloggers and hompyiers didn't cite or link. Someone said that the big portals encouraged because it allowed all of the content to be searched inside the portal, rather than offsite. Does anyone have any more information on this? Interesting to hear this. It would be great if you could do a similar post (or even a series) detailing the Japanese blogging scene! what it allows you to do is to display a particular post from someone's mini-hompy (cyworld) - if the permission setting of that post is set to "allow scrap" - not from just any website. there's a watermark-like feature that goes with it, which displays the original author's name and the link back to the origianl mini-hompy. i consider cyworld as a "korean way of blogging" and its popularity stems from various cultural aspects of korean culture. i'm writing a small chapter on cyworld for an upcoming blog book (as part of the Digital Formations series by Peter Lang) - so if you're interested, I'll let you know when it's published. Thanks jaz, I'll update my post. I'd love to see the book. Joi, I don't think Korean blogging scene will be like the US/Euro blogging scene. Like the famous Korean garden, it's a world of secret gardens over there. Opinions do not flow freely over there without the protection of anonymity and peer support. Photos, on the other hand, can flow through those walls with minimal trouble. Of course, some photos can cause cyber-tsunamis. For example, photos of newborn babies posted by bored nursing assistants angered millions of young mothers recently. It started innocently enough, at a Daum Cafe discussion forum dedicated to young mothers, with a post talking about some baby photos at a Cyworld hompy. Within practically hours, the news was on mass media and the police started investigating. Meanwhile young mothers started scouring the net for similar photos of newborn abuse. Don't ever make young mothers angry. Very scary. Anyway, I think relatively harmless nature of photos might be why Enbee.com is now focusing more on photo sharing than blogging. 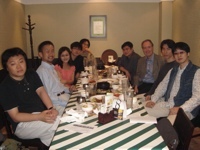 Next time you go to Korea, you should meet with Suman Park (sumanpark.com), CEO of Enbee.com. This is a pretty accurate overview of the blogging scene in Korea. I've been in Korea observing the growth of blogs in Korea for the past couple of years and I would agree that blogging in Korea is quite different from blogging in the US. Almost all of the major online portals and newspapers in Korea have a hosted blogging service but they all insist on having closed networks so there is very little conversation occuring across these networks. It's a shame that it has to be this way. Michael, Cyworld (leading hompy service in Korea) has a very active mobile service. It's my understanding that Cyworld's mobile service is generating approximately US$200,000 per day in data traffic revenue for it's parent company, SK Telecom. Cyworld users use the mobile service to read comments left on their hompys, write comments on other people's hompys, and post pictures on their hompys. You can read a more detailed information on Cyworld's mobile service on my blog(http://weblog.xfiniti.com/ceo/584). "Many aspects of the Japanese blogging scene seem to be following in the footsteps of the US blogging scene, albeit with some differences." How many European "blogs" don't use rss feeds and trackbacks and pings? Indian? African? Russian, Eastern European, Middle Eastern... What makes us think they use such features, or even would want to? How many "weblogging platforms" and their feature sets are we really aware of? How can we be sure that what we have/use is the best there is? Nevermind that they don't use what we consider to be the most basic communication technology: english. This report from Korea is truly fascinating! Especially the hompy bit! "This is my personal home page, where only my friends and family and people I have invited can keep tabs on and in touch with me. I am not a citizen journalist, nor am I a keyboard warrior. But here I am. 10 million of us are." How nice of you to mention Korean style blogging to the rest of us. I for one, was raised in Australia and therefore fully accustomed to Australian lifestyle, but my older sister who was born in Korea and partially raised in Korea seemed to be on Cyworld almost everyday. Now what I mean by everyday isn't just for my sister. If you walked into a Korean Internet Cafe in Sydney, almost every Korean there would be on Cyworld. It's almost like a craze addiction thing that's going on in Korea. And amongst school kids, teenagers and young adults, if you don't have website to show then you are pretty much "left" out of the internet social network. Anyways my sister being so Korean allowed me to study how Korean side of things worked. (Except I didn't make articles). Anyways skipping all that of what you have mentioned, Cyworld did introduce referencing technique and it has been implemented very well. Starting from the top line of that paragraph block: Source, Creator, Creation Date, Public access setting. myspace and xanga are not technically (programatically) closed but from the marketing/end user experience level it is very similar to hompy. For one ,the users more closely identify with their blogging service than say . . . typepad users. People ask "Are you on xanga?" but never Do you use six apart? Most of their friends are also on the same service creating a community feel that other blogging services lack. (cross linking within the same site is prevalent). Really this is what Friendster could have been if it didnt spend the last 2 years rebuilding the site. The reason I think xanga and myspace becamse "closed" is because a combination of well packaged/integrated product/functionality and demographics of tech savvy but not programming savy users. I was looking at Yahoo! Korea blogs, and found something like that - scrap (you can set the permissions while posting). I still didn't exactly understand what it really does. Need to see in more detail, I guess. You've got my email in the morning as following?! cute, weird" content to "raise" the number of visitors of hompy. Nah. I think it was probably the smiling habit of native Koreans. I've noticed that when they talk with strangers whom they are not angry at, they tend to use a smile like a period. If the smile arrives too early, the tail of the last word gets warbled. If the spoken language is Korean, there isn't any problem because a Korean sentence often has little meaning at toward the end but, for English, it's a problem. But then I also get yelled at (Moyo? Audiyo?) by Korean taxi drivers when I taper off my Korean sentences too early so I may be wrong. there are two internet business models that were created in the orient (all in korea) - mmorpg and 1st degree social network (cyworld). cyworld's success is not an accident. 2. the interface is very female oriented. most american websites are very function driven and male oriented. however, cyworld design is female and emotionally oriented. Homepy backgrounds are chockabloc with doe-eyed bunnies and green-haired schoolgirls, but there are a lot of darker, more masculine backgrounds too. I work at a cram school and watch my co-workers browse their friends' homepys, on average, 3 or 4 times in a 10-hour workday. As a side note, Homepys only became available to foreigners very recently; set up an English service, about five months ago. "Geee... I wonder why that is... Six Apart Japan? Technorati Japan? hehehe ;)"
blogger.com and other blogging services are fully translated into Korean and have some korean users etc. So I would say that the local closed network homepy are more popular either by ad budget (I mean this is a country where MMORPG have bigger ad budgets than Coke seems to have) or culture. While I hate to say anything bad about Korea, is this closed network infastructure normal for Koreans? Is this a cultural thing? anyone? Scrapping is definitely something that drives people to put up the photos. If you get scrapped, you will get a traffic bump as people trackback to see the source. I also like the reputation/points system: you can buy items not just for yourself, but you can gift them. And get karma points for doing it! It even shows you the direction a particular rating of yours is going: your very own billboard charts. I have a write up with pics here. btw So-Net launched minihome in japan. I can't see a mention "licensed from .." anywhere, but it seems like a dead copy of cyworld - even down to not working in firefox :( Does anyone know if it is a copy or a license? HanGame's CuRuRu also seems to be in the same vein, although the avatars go further into games etc. Hi! I'm Ivan,and...i went through your blog...it's fantastic compared to mine...well...juz wanna congratulate you...and...keep up the good work!!! Gambadei!!! Interesting to read your post. I red in the comments things like "walled contents", "Korean culture", "western-style blogging". I would like to try explaining a bit about this. I think comments like "Korean blogs do not use standard APIs", etc are quite biased and very western-centric. How could they use them since they started way before those APIs were developed? A little bit of context about Korean broadband: just like Japan started very early in mobile phone services, Korea connected through broadband nationally while others were still learning about the dial-up modem's "dong dong" sound. As a consequence, like it is natural for Japanese mobile users to receive mobile magazines, check auctions, etc. from the mobile, the average Korean housewife is now used to use online banking, shopping, downloading forms from the Govt' websites, etc. thanks to over 5 years experiencing broadband at home: this is not about network infrastructure, this is about content and service, which are now extremely advanced and "natural" for everybody. Now about Cyworld/minihompys: rather than the sites design, what is important is the revenue model and the secure environment. Western style weblogs generate revenues through hosting only and their content are mostly open to whoever visits. There is not much concept of privacy nor alternative revenue models. Cyworld allows users to restrict (none, part or all) content access to their trusted ones. So it is not true that the content is "closed" or invisible. Is is just partly private, and does not try to flood search engines and pretend be a journalist or an insightful expert: the purpose is like the one of social networks, with the support of an attractive homepage. The basic service is free, to grow the community, what is paying is all customization: if you want some nice background music list for you and your visitors, if you want your avatar not to look like an idiot in trunks in an empty room, if you want to change the frame/thema of your page for the season or a special event, offer a gift to your friend, etc.. The billing system allows you to pay on your mobile phone or ADSL bill whatever your carrier (credit card also possible), and THIS is innovative. SK Telecom (~50% mobile market share in Korea) bought the Cyworld company and linked the content to their messenger (NATE ~ i-mode) to allow any user to check their or others' hompy. Now the data revenues from people browsing on their mobile far exceeds the revenues from avatar/music/etc. If you can call old-style weblogs 1st generation, solutions like Bloggers/Typepad 2nd generation, Cyworld is the 3rd generation without doubt as it combines with excellence all ingredients in an exceptionally casual/social network, much more dynamic and interactive than current western-style ones. Last, SK Telecom has been working hard on packaging their Cyworld solution to sell overseas, especially in countries with Broadband environment, as Cyworld is pretty heavy on the network (animations, sounds, photos...). I suspect Sony bought the solution from them, as it is much cheaper and faster than developing in-house. Also, So-Net can bill their ADSL users directly. With the mobile connection, Cyworld is a truly successful "convergent" or "ubiquitous" service, and the major benefactor would be mobile phone companies generating traffic from it. KDDI launched their own recently and theuy apparently did it right. This service will contribute migrate their users from low-data to those flat-fee data plans, as you need an array of frequently-used services to motivate users for that. PS: I lived/worked 4 years in Japan, 1 year in Korea and now in China in wireless/consulting. I sent some info about Cyworld to Loic Le Meur about 6 months ago but he was probably busy with the SixApart business. Phantom Poet Graffito in association with Spoken X Digital Media Group invite you to witness the powerful experience of the spoken word Xplosion as Di Rati X spray the spoken spectacular. And remember--I bought plenty of fish from the Korean markets while I was growing up in Brooklyn. . I would like to recommend Unit Pride which is a novel based on the Korean War. Easiest to buy at Amazon. Great critical reviews! Hompies and blogs are certainly different but I think that when it comes to the users' perception (which I think matters the most) the gap isn't so huge -- plus Cyworld is "getting" the 2.0 which makes the whole thing more interesting. Thanks for the post. nice review but just to let you know that the scrap function in cyworld DOES show where it was scrapped from and links to the original post and the owner of the hompy. Listed below are links to blogs that reference this entry: Korean Bloggers. Joi Ito - "Korean Bloggers" by Joi Ito is licensed under a Creative Commons Attribution 4.0 International License.